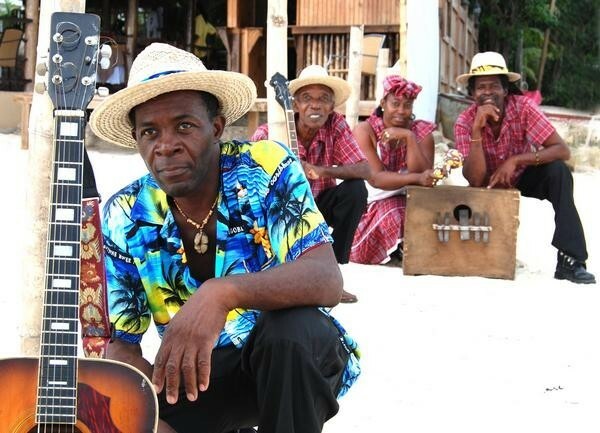 Formed in the rural backwater of Trelawney in 1986, the Blue Light Mento Band is one of the best-kept secrets of Jamaican popular music. Prime exponents of mento, a distinctly Jamaican form of traditional folk music, the group has long been acclaimed on the island for its mastery of the genre, delivering bawdy humour and social satire with verve and zest. Yet despite holding residencies at several of Jamaica’s most prominent nightspots and making well-received appearances at important festivals, the group is almost totally unknown outside the island, a situation that is set to change with this debut album, recorded at the legendary Harry J studio by renowned engineers Stephen Stewart and Sam Clayton Junior. Mento, which was born from the marriage of European melodies with African rhythms brought about by the intermingling of cultures that defined the colonial period, can rightly be hailed as the first form of indigenous Jamaican popular music to ever be recorded. Indeed, during the late 1940s and early 1950s, the Jamaican music industry was founded on mento, when entrepreneurs such as Ken Khouri, Stanley Motta and Dada Tewari began recording local mento artists, some of whom would gather at Kingston’s Jubilee Market on Saturdays, singing mento songs and selling the corresponding sheet music as penny tracts. The resulting recordings were typically shipped overseas in an effort to capitalise on the calypso craze then sweeping Britain and North America. But although the social satire and ribald material of mento bore similarities with the calypso of Trinidad and other Caribbean islands, mento has uniquely Jamaican aspects that set it apart, most notably in its instrumentation. Often employing a banjo, hand drums and various elements of homemade percussion such as graters, shakers and scrapers, the cornerstone of the mento band is the ‘rhumba box,’ a giant rectangular item whose large metal keys provide the bass notes, resonating through a hole in its front. The instrument is a New World adaptation of the mbira, the thumb piano of central and southern Africa. Additionally, as mento draws from fife-and-drum music, there are often homemade wind instruments, such as bamboo saxophones and flutes, or perhaps a tin whistle or mouth harp. Although the growing popularity of rhythm and blues signalled mento’s gradual decline, mento was still an important element of sound system culture during the 1950s. 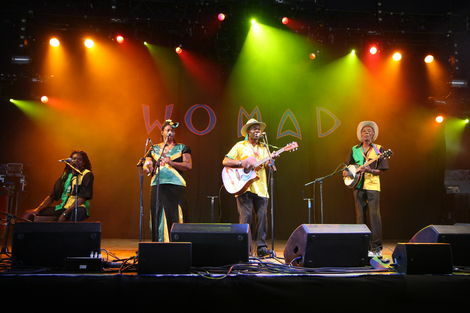 By the time ska exploded on the scene as an electrifying big-band style that swept the island as independence beckoned, mento was seriously waning, but its cadences and melodies could still be heard in the root of the new form, and indeed, many mento songs were subsequently adapted in ska, rock steady, and reggae, its rhythms still forming undercurrents of the current dancehall style. After ska and rock steady gave way to reggae in the late 1960s, mento remained a regular feature of the north coast hotel scene, providing a pleasant musical backdrop for overseas visitors. Then, during the mid-1970s, vocalist Stanley Beckford started a new craze by blending mento-styled vocals with a reggae beat, resulting in several impressive hits. During the new millennium, shortly before his death, the aging Beckford recorded two albums with a mento band from May Pen, which raised awareness of the form in France, but Beckford’s take on mento was always something of a hybrid, rather than a straightforward presentation of the music in its original form. Following on from Beckford’ success, during the last few years, classic mento was also given a boost by several impressive retrospectives. Lanford Gilzene, founder of the Blue Light Mento Band and popularly known as Culture George, has considerable musical experience. Born in Trelawney, he was raised on the other side of the Dry Harbour Mountains in the town of Spaldings, Clarendon, where his vocal talent was noted at the local Pentecostal church. In 1975, while still a teenager, Lanford made a Rastafari-focussed debut recording, ‘Gone Me Gone,’ produced by Norman Grant of the Falmouth-based Twinkle Brothers, but poor financial return from the experience led Gilzene to seek more reliable employment in the pest control industry. Then, in 1986, a friend encouraged him to form a mento band for the opening of a new hotel in Trelawney, and the Blue Light Mento Band was born. In 1991, Gilzene won the annual Festival song competition with ‘Oh It Is Jamaica’ and also won the Pop and Variety competition on behalf of Trelawney with ‘Mammy Come Dance This Festival’; he has issued gospel CDs as a solo artist, but the Blue Light Mento Band has been his most consistent outlet for musical expression. Like Lanford Gilzene, the other members of the Blue Light Mento Band all have a natural grounding in music as a form of everyday expression in their lives. The elder of the group, banjo player Wesley Balds, is currently 80 years old; hailing from the town of Black River in the rural parish of St Elizabeth on Jamaica’s picturesque south coast, the devout Mr Balds sees his musical touch as ‘a gift from God,’ since he taught himself to play by ear as a child, convincing his grandmother to purchase a banjo for him after becoming fascinating by the mento sound. The dreadlocked rhumba-box player, Courtney Clarke, comes from the small-town district of Granville, on the outlying edge of Montego Bay, and turned to music during his teens after being taught the art of the rhumba box by a neighbour. Vocalist and shaker player Donnette Leslie, who comes from the remote Cave district, near Bluefields in the neglected southwest, was lured into music after Lanford Gilzene spotted her talents on the keyboards and encouraged her to join his backing band, back in the days when he was performing as Culture George. The Blue Light Mento Band has been a popular feature of countless festivals in Jamaica, including Harbour Fest, Ocean Spray Fest and the massive Denbigh Agricultural Show. They were particularly popular at the Jamaica Coffee Festival, held in 2005 at the grounds of Devon House in uptown Kingston. On this debut recording, the Blue Light Mento Band make clear why mento is so beloved by devotees. As group members all come from remote and underdeveloped areas of Jamaica, their sound is unadulterated by urban influences, retaining the country feel that has always defined mento’s original form. Retaining the unpolished quality of mento at its most genuine, the album holds just the right amount of rawness, yielding an honesty that is lacking in most of the island’s contemporary musical product. In the best mento tradition, the fifteen songs cover a range of topics, featuring folk favourites, suggestive ditties and songs examining the finer points of human relationships. Audiences may already be familiar with songs such as ‘Wings Of A Dove,’ once adapted in ska by Bob Marley, ‘Brown Girl In The Ring,’ a children’s ring game song adapted in disco by Boney M, ‘Dream Of Me,’ a big hit for Mac and Katie Kissoon in the mid-1970s, and the oft-versioned ‘Sly Mongoose,’ which references radical religious leader Alexander Bedward. Similarly, the group tackles mento classics such as the suggestive ‘Hold Him Joe,’ ‘Goosey’ (aka ‘Gungu Walk’) and ‘Water Your Garden’ with considerable aplomb, and there are also fine renditions of the ring game songs ‘Hill And Gully Rider’ and ‘Emmanuel Road,’ joined as a mini medley, as well as the heartbroken ‘Come Back Liza.’ ‘Jammin Tonight,’ which exhorts the listeners to join in the mento party, adapts a traditional number known as ‘You Safe,’ while in contrast, ‘10,000 Years’ adapts a bible hymn within the language and symbolism of the Rastafari faith. The originals are equally captivating: the ballad ‘Crying’ relates a riverside tale of seeking to give comfort in times of hardship and distress, while ‘Honey And Honeycomb’ has Lanford pledging eternal devotion to his sweetheart; ‘Sweet Sweet Jamaica’ naturally expresses the enduring appeal of the island for visitors. Perhaps most notable of all, the band’s adaptation of Toots and the Maytals’ much loved ‘Sweet And Dandy’ recasts the reggae hit as a mento country stomp, with none other than Toots himself contributing the vibrant harmonica. With this new album, the Blue Light Mento Band is poised and ready to bring mento into the greater public consciousness overseas. Tune in to their musical skills and discover why mento music will live on forever.